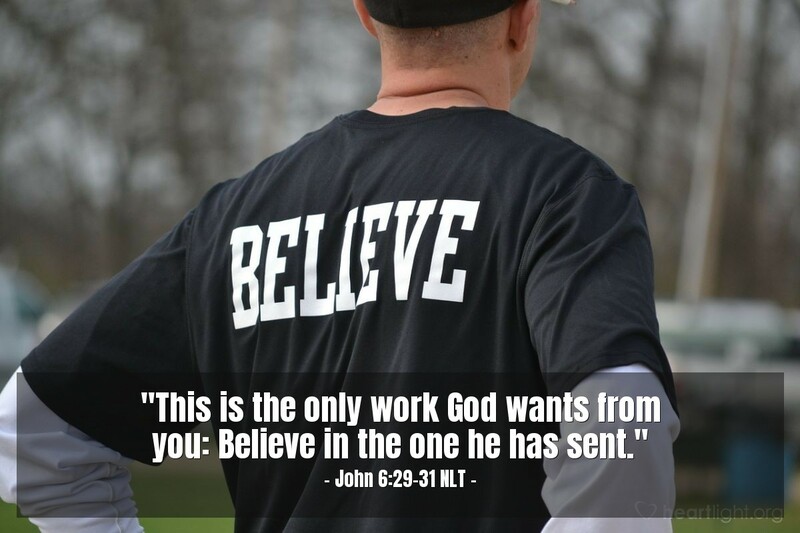 Jesus told [the people in the crowd], "This is the only work God wants from you: Believe in the one he has sent." They answered, "Show us a miraculous sign if you want us to believe in you. What can you do? After all, our ancestors ate manna while they journeyed through the wilderness! The Scriptures say, 'Moses gave them bread from heaven to eat.'" Come on, folks who lived in Jesus' day! How many times does he have to do something spectacular? He gave you bread (John 6:1-15). He got across the lake mysteriously (miraculously, John 6:22-25). You've heard about his great healings elsewhere. What will it take to prove to you he is from God? Oops, all I need to do is change the century, and the story is the same for our day. Jesus has done so many things to bless us today. How many more will he have to do before we truly believe he came from God and he gives us life? Father, forgive me when I discount the wonderful things you have done for me through your Son Jesus. Forgive me for not giving thanks for your blessings in my life. Forgive me for not seeing Jesus' work of shaping me and changing me. I don't need another miracle or mighty deed to believe. I truly believe that your Son Jesus gives life. Thank you. In Jesus' name. Amen.